One of the best places to take winter photos in Northwest Indiana is along the Lake Michigan shoreline. Every winter is different, but most winters the lake develops large ice shelves that form into talk mounds and shapes and other surreal looking landscapes. The ice shelves surround the beach and develop sometimes miles out into the lake. 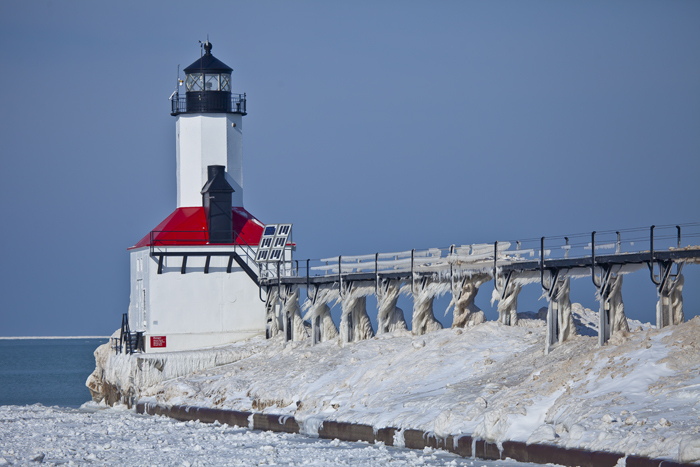 In this photo, the ice shelves surround the east pier lighthouse in Michigan City where ice has already overtaken the catwalk and the walkway beneath.